WSO and the Wisconsin Bird Conservation Initiative developed the Bird Monitoring Kit program to allow educators and students to study birds and their habitats. 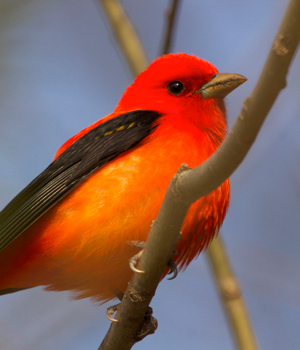 By learning about the local bird community and building bird identification skills, Bird Monitoring Kits help students gain a greater appreciation of the natural world and its conservation. 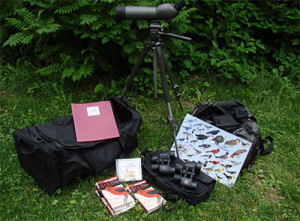 Bird Monitoring Kits contain all of the tools necessary for starting a bird educational program, including high-quality optics and reference guides. WSO would like to give a special thanks to Eagle Optics for offering a generous discount on the optics. Since 2003, Bird Monitoring Kits have been placed with 40 host organizations throughout Wisconsin, including Audubon Society chapters, nature centers, bird clubs, natural history museums, schools, and 4-H Clubs. We have received much positive feedback from host organizations. Bird Monitoring Kits are available for loan by host organizations. To locate a kit nearest you, please see the contact information below.